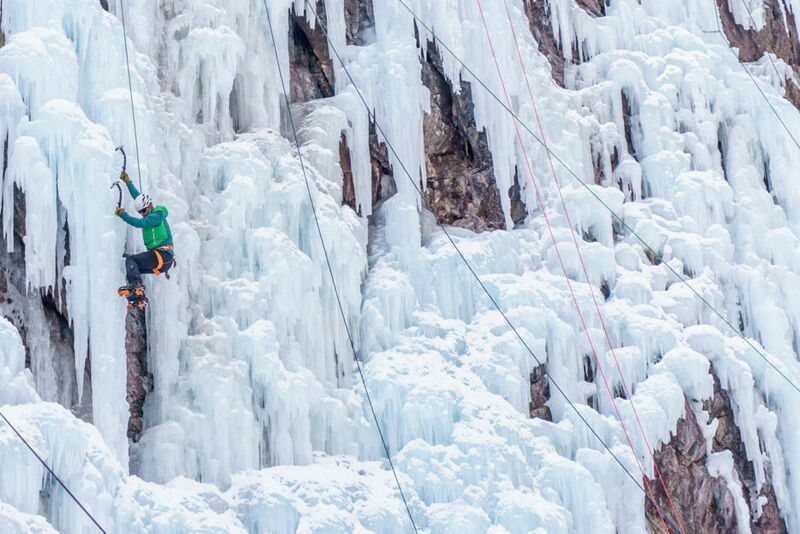 Last winter, photographer Katie Botwin spent a day in the Ouray Ice Park in Ouray, Colorado. 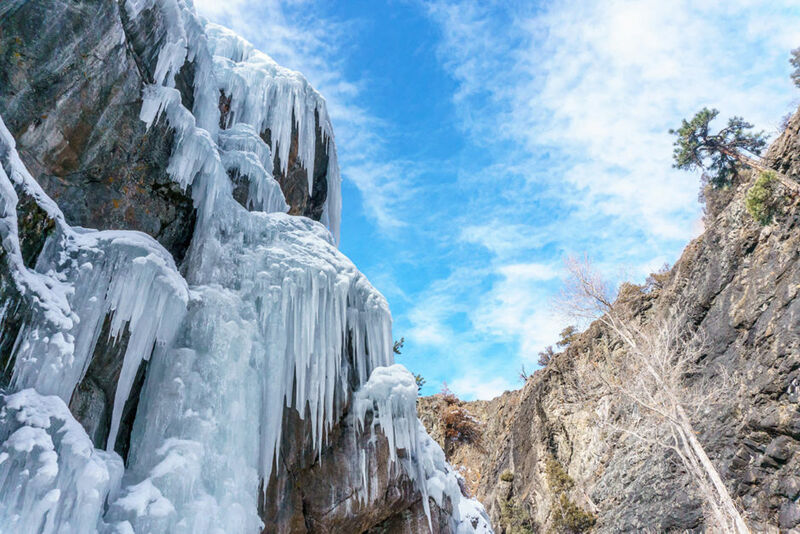 The park is made using the city’s overflow water to turn the Uncompahgre Gorge into a stunning wonderland of gleaming ice. The three miles of vertical terrain offer a range of options for expert climbers and first-timers. Below are stunning images from Katie’s trip, along with her tips for experiencing this epic trip yourself. 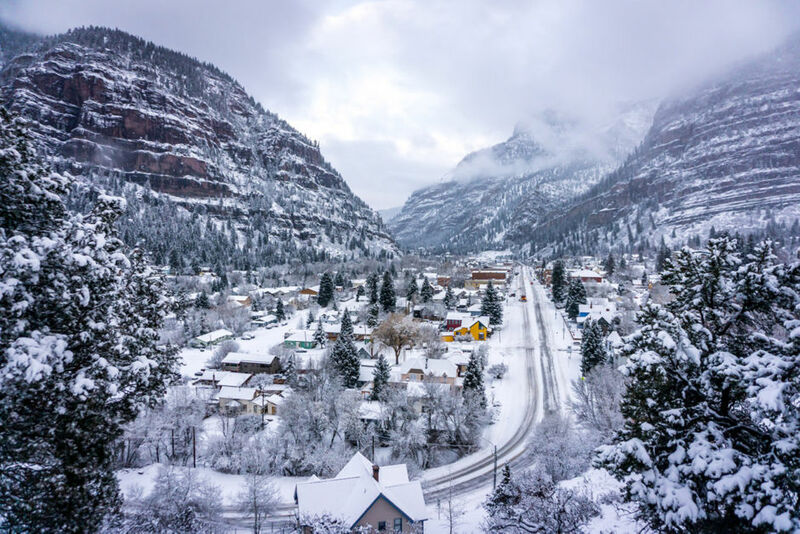 Ouray, Colorado, a little town tucked into the San Juan Mountains that’s often called the “Switzerland of America,” is home to the remarkable Ouray Ice Park. 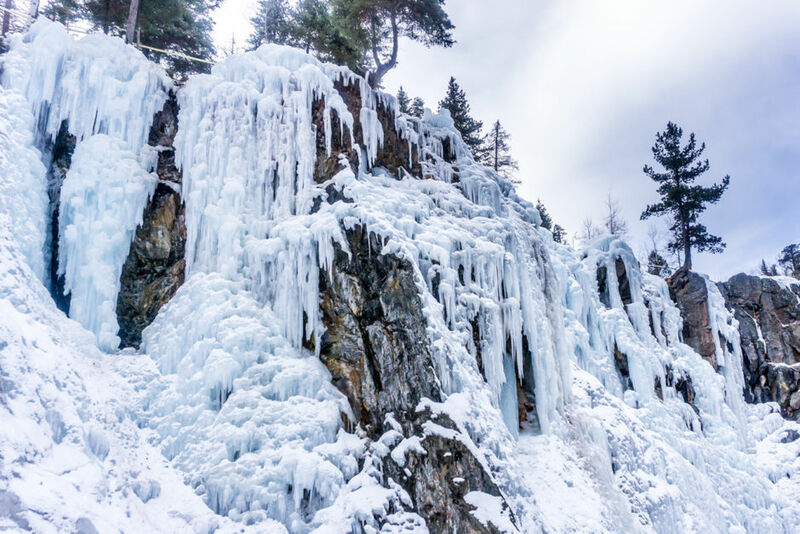 Situated in the Uncompahgre Gorge, the Ice Park is a man-made wonder that is painstakingly recreated each winter. 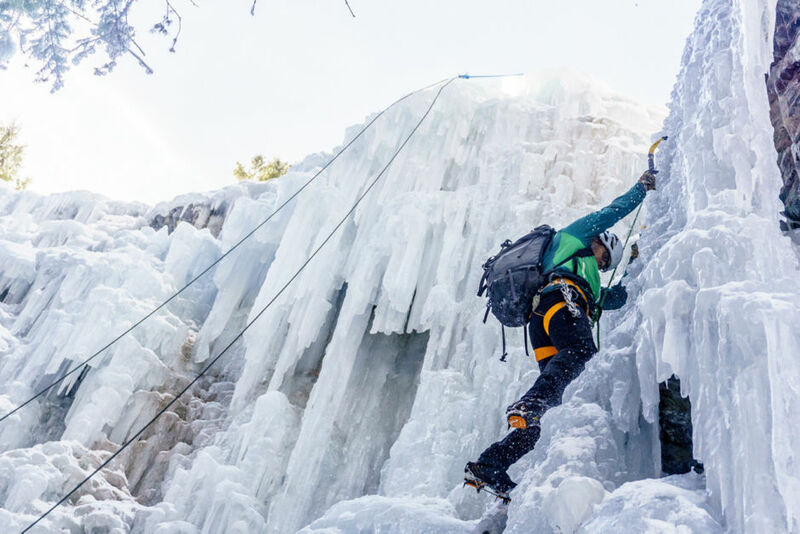 Since the essence of ice climbing is swinging sharp, pointed tools into walls of ice, getting started can be a little intimidating. 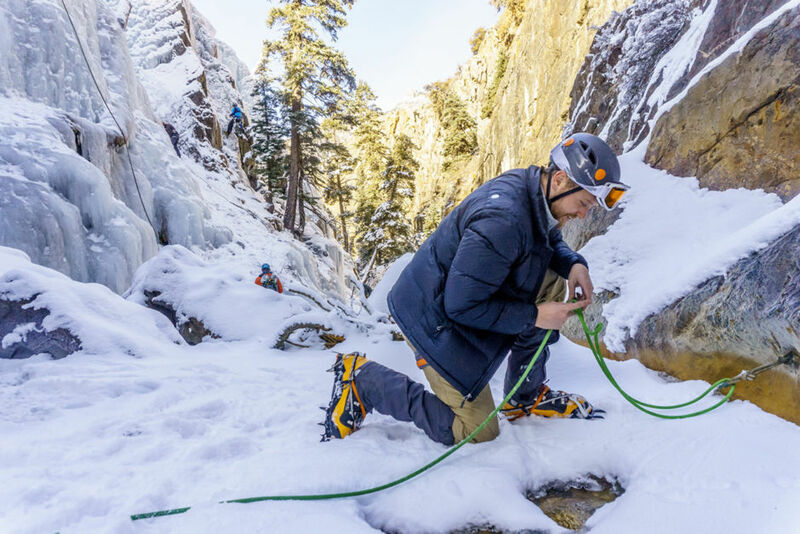 Taking lessons from a pro to learn the basics of ice climbing can help ensure you have a great time while keeping yourself and others safe. Here, Lindsay learns some essential rope management skills and how to tie an anchor. When you show up to the Ice Park, you won’t be going for a typical stroll in the park. 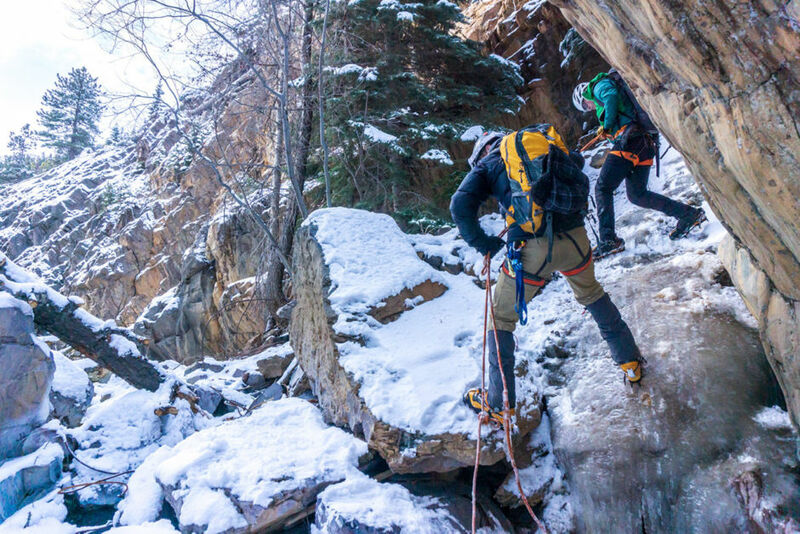 Winter in Colorado means frozen water and snow, and you are going ice climbing after all. You won’t necessarily need serious technical skills to get around, but you will need the proper equipment. 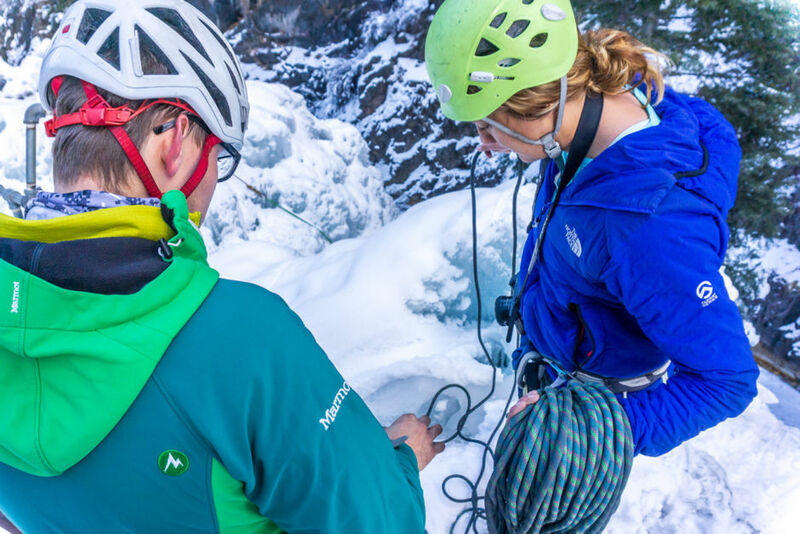 Whether you’re bringing your own or renting from a place like San Juan Mountain Guides, be sure you have all of the technical gear you’ll need – like crampons and ice axes. Also, pack plenty of warm layers, water, and food. 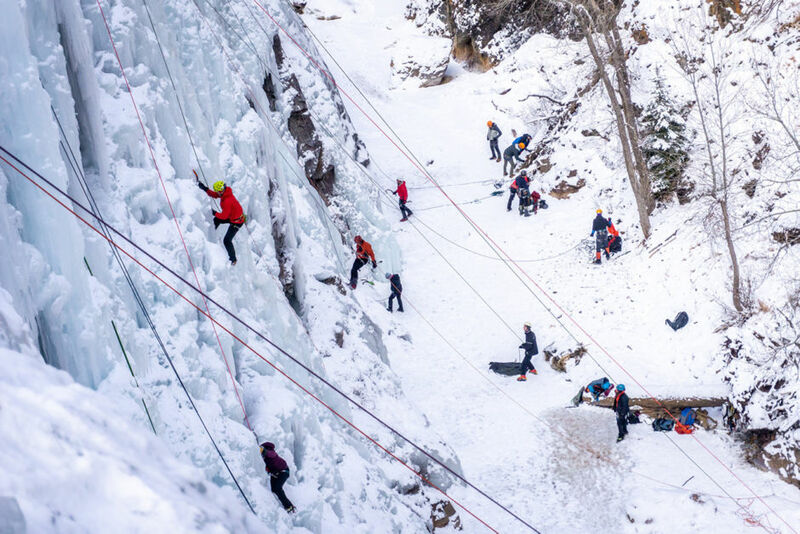 The Ouray Ice Park isn’t your everyday sight. 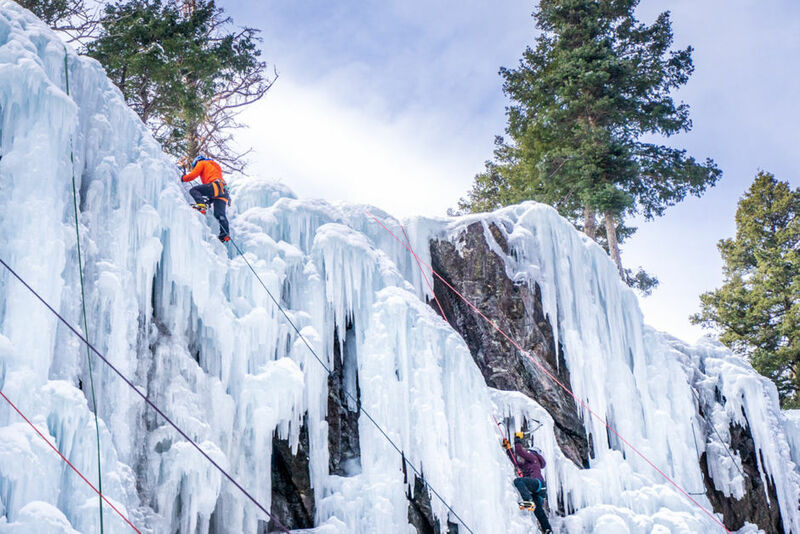 You’re sure to see some breathtaking scenery while making your way around these incredible walls of ice. The Ice Park is gravity fed, which means no pumps or motors are used to create what you’ll be digging your ice tools into soon enough. This means certain areas of the park can be closed while others are open, and while formations may look similar, they are never exactly alike and are always changing. Safety is key while in the park. If you’ve never been, or are still starting out, a guide can help keep your group safe as well as everyone else in your vicinity. Check the park’s website for a listing of independent guide operations. Here, Chad practices how to tie a clove hitch knot. Once you’ve mastered the safety skills and learned all about climbing techniques, you’re ready to sink your tools into the ice. The park offers routes for every skill level. To warm up and practice our technique, we start on a route with a little less vertical. Although the ice is human-made, the gorge itself is a glorious work of nature. When your arms need a break from climbing, you can enjoy a long walk. 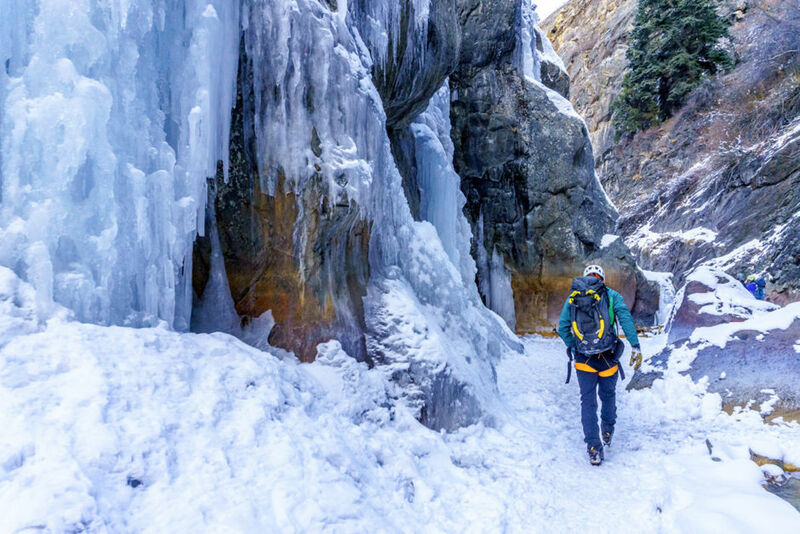 The stunning gorge and three-plus miles of frozen waterfalls will leave you in awe. On our day in the ice park, the sun occasionally peaks through the thick gray cloud cover – giving the ice a glowing blue hue. As the day continued, more groups show up, which makes safety even more essential. Climbing below someone can result in shards of icefall catching you unaware, or you letting loose an icicle onto someone below you. Going on a weekday in the early morning usually helps with crowds, but you can always expect others to be climbing. Watching a skilled climber can help you learn how to climb more efficiently and smoothly. Though your forearms will inevitably begin to burn, learning how to properly engage your legs while climbing can help increase the number of laps you’re able to take. Above, Kerr gets playful with an ice pillar.